Best Film Soundtrack Award at Treviso Soleluna Doc Festival! ‘Tides – A History of Lives and Dreams Lost and Found (Some broken)’, the film about the River Foyle wins two awards on the same evening in two different prestigious film festivals! Honourable Mention Award for Best Film in the section "State of Error" at Milan Film Festival and Best Film Soundtrack Award at Treviso Doc Festival! 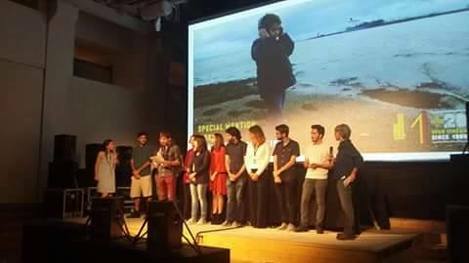 TIDES, directed by multi award winning Italian Film Director Alessandro Negrini, recently won the Best Cinematography Award at Sole Luna Film Festival in Palermo and it has scooped three awards and five nominations in last few months. For the skilful experimentation that results in the ability to render through poetry and music the universal theme of the border"." On the same night, ‘Tides’ won the Best Film Soundtrack Award at Treviso Doc Festival with the following Jury Motivation. A well conceived choice of few sparse original elements: the elegance of a delicate piano, occasionally conversing with an eerie waterphone, the discrete brush of a nylon-string guitar, all tastefully interspersed with touches of nostalgia via quotations of period music and voices from the past layered in mature and serene irony. The whole flows as smoothly as the alternating tides it was designed to underline, providing an exquisitely cohesive aural complement that effortlessly follows the lyrical itinerary of the visual narration An ultimately enjoyable proof of creative coherence and depth." Alessandro Negrini, who attended the Award ceremony in the Palace of 300, said he was honoured to receive the awards. The director said "The film is an invitation to rediscover our capability to remember our forgotten dreams and a tribute to a magnificent river with an incredible history. The voice of the River Foyle is Northern Irish actress and former drama student at Magee College - Emma Taylor. TIDES is a dreamlike and visionary portrait of the River Foyle in Northern Ireland. Supported by Northern Ireland Screen, Media and The Italian Institute of Culture in Edinburgh, the film is written and directed by Alessandro Negrini, director of the award winning documentary ‘Paradiso’. Director of photography is renown Norwegian OddGeir Saether (Inland Empire, David Lynch). Editor of the film, Belfast based Stuart Sloan. Original Music by Cris Ciampoli. Executive Producer William Silke, Associate producers DocuCity, Basaglia Group.